Astronomers have detected dramatic temperature changes on a solid planet far beyond our solar system, likely caused by massive volcanoes on the super-Earth’s surface. The planet, 55 Cancri-e, is a volcanic inferno on which Cambridge University researchers have detected temperatures changing from 1,000C to 2,700C. NASA’s Spitzer space telescope has been gathering data about 55 Cancri-e for over two years. In the study, published Monday in Monthly Notices of the Royal Astronomical Society, Cambridge University researchers document how they discovered drastic swings in hot temperatures, which they think are a result of huge volcanic activity. Volcanoes may eject gigantic plumes of gas and dust that cool the planet’s surface. According to the scientist’s measurements, these eruption clouds could shoot up to 5,000 kilometers into the planet’s atmosphere – higher than anything measured in Earth’s solar system. “While we can't be entirely sure, we think a likely explanation for this variability is large-scale surface activity, possibly volcanism,” said lead author Brice-Olivier Demory, of the University of Cambridge, in a statement. 55 Cancri-e is a super-Earth – a classification of planet that is both rocky (rather than gaseous) and which measures between two to 10 times the size of Earth. The planet measures around twice the diameter of Earth, eight times its mass and roughly 40 light-years (380 trillion km) away. 55 Cancri-e was first detected in 2004. It was the first rocky planet discovered beyond our solar system. Since then, developments in space technology have enabled scientists to record environmental conditions on distant planets. So far, 2,000 so-called exoplanets have been detected, orbiting distant stars. “The present observations open a new chapter in our ability to study the conditions on rocky exoplanets using current and upcoming large telescopes,” Madhusudhan said. Scientists describe 55 Cancri-e as an extreme planet. It orbits very close to its star and extremely fast, meaning one year lasts only 18 days. 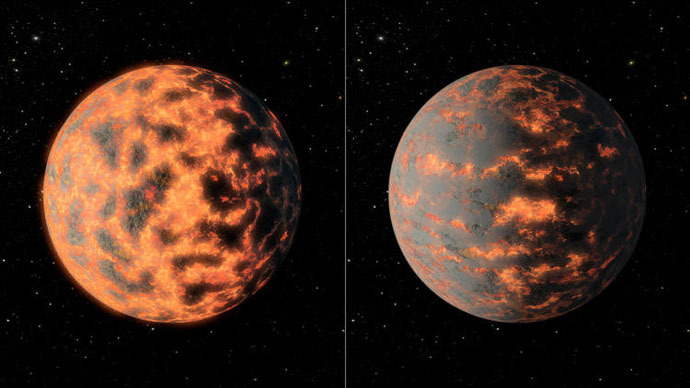 There are no day and night changes, as Cancri-e is tidally locked. This means it doesn’t rotate as Earth does, creating a permanent ‘day’ side and ‘night’ side. On the day side, temperatures are so high the planet’s surface is likely to be partially molten. Earlier data indicated the planet is rich in carbon and that a third of the planet could consist of diamonds. Regarding the new measurements, Madhusudhan said: “The planet could still be carbon rich, but now we’re not so sure - earlier studies of this planet have even suggested that it could be a water world.